Few other charges in the State of Florida have as many different variations, degrees and categories of victims as the offense of battery. Commonly referred to as “simple battery” it means to touch another individual without permission. It is also defined, though rarely charged as “intentionally causing bodily harm to another person.” There are common misconceptions about battery. Should you find yourself being accused of this crime, contact an Orlando battery defense attorney immediately. Where is the evidence? Some clients unfamiliar with rules of procedure, law, and evidence are under the mistaken impression that the case has to be dismissed because there was no injury, photographs, or third-party witnesses. The “testimony” of the “alleged victim” is the evidence. It is possible, though difficult to prove a battery solely on the testimony of the alleged victim. Well the jury cannot find me guilty based on just her testimony, right? Probably not, but still possible. If the complainant’s testimony convinced the officer that she/he had probable cause to make the arrest, a chance exists that a jury could find her testimony sufficient to return a verdict of guilty. But there are no injuries! It is not necessary that the prosecution proves an injury, but if they can show “serious bodily injury” they may be able to upgrade the case to a more serious charge. All they have to show is that she was intentionally touched against her will. OK, I did touch her, so that means that I am guilty? Absolutely not! It still has to be proven in court, you have a right to remain silent, and there are several defenses to an intentional touching, most common being self-defense. 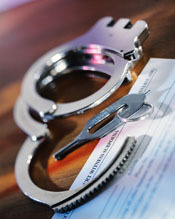 Be sure to invoke your rights and contact our Orlando criminal defense attorneys at once. FELONY BATTERY: The statute defines this offense as a simple battery which results in great bodily harm, permanent injury or permanent disfigurement. Note that if it was the intent of the defendant to cause any of these stated injuries or impairments the charge can be upgraded again to a second-degree felony as outlined in the AGGRAVATED BATTERY section below. BATTERY-STRANGULATION: Third-degree felony. If normal breathing or circulation is impeded as the result of touching or pressure on the victim’s neck or throat area the state can file this charge. The statute also allows this charge if the nose or mouth of the victim is covered. It also requires a dating relationship or blood relative. BATTERY-(1 PRIOR BATTERY): As previously noted battery is an enhance able offense, which is another reason to treat this case with caution. If the accused has a prior battery and gets a new battery charge, the State has the option of “upgrading” the case to Circuit court. As stated in this section that increases the penalties by a factor of five. Use of a deadly weapon. Normally, this is a battery involving a handgun (pistol whip) or an automobile.